Igloo Products Corp., the nation’s largest cooler manufacturer, has added a new tent style to its Igloo Outdoors product line-up—the Log Cabin Lodge tent. The Log Cabin design is the first in a series of proprietary and protected designs Igloo will be bringing to the market. The Log Cabin Lodge tent has a classic log cabin look and feel with all of the best amenities of an Igloo Outdoors tent. It’s perfect for a large group setting up base camp or just out for a weekend getaway. Igloo Products Corp., the nation’s largest cooler manufacturer, has added a new tent style to its Igloo Outdoors product line-up—the Log Cabin Lodge tent. Igloo product manager Michelle Stone says, “The Log Cabin Lodge tent has a classic log cabin look and feel with all of the best amenities of an Igloo Outdoors tent. It’s perfect for a large group setting up base camp or just out for a weekend getaway.” The Log Cabin design is the first in a series of proprietary and protected designs Igloo will be bringing to the market. The eight-man Log Cabin Lodge tent sleeps eight comfortably and has a screened-in porch for outdoor enjoyment. The cabin silhouette with the unique log and river rock pattern has the true look and feel of a log cabin. The tent has Igloo exclusive MaxDry weather protection system to eliminate water seepage, Cool Riser Technology—a system of lower mesh vents that draw cool air in from the base and hot air out through the roof—and UV-Ban—a specialized coating that reflects heat and harmful sun rays with an ultraviolet protection rating of 50 plus—to create the ultimate rustic luxury tent. With reflective tape that highlights the tent door at night, convenient mesh pockets and a hanging corner shelf to keep smaller items organized, water resistant tub floors designed to deflect water away from seams and easy-to-access weather-protected passage for cables; the Log Cabin Lodge tent is exceptionally featured. The 156 sq. 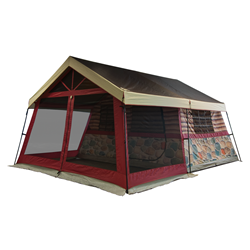 ft. Log Cabin Lodge tent will be available at retail in Spring 2014 with an MSRP of $249. For further information about the Log Cabin Lodge tent or about any other Igloo product, contact Katie Davis at KDavis(at)igloocorp(dot)com or visit the company’s Web site at http://www.igloocoolers.com.